Some customers have assets stored on multiple origin servers and want to route various requests to specific, different servers based on criteria they supply (e.g., asset type, file directory, host header). Fastly offers customers the ability to set conditions on their origins, which simply adds an if statement block to your VCL. Click the Attach a condition link to the right of the name of an origin server. The Create a new request condition window appears. 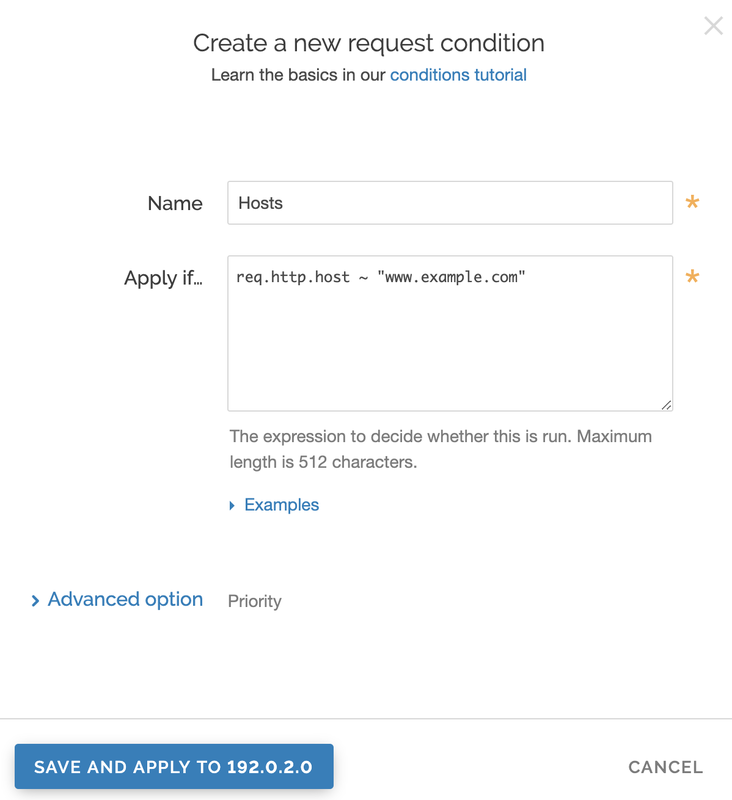 In the Apply if field, type the conditions that you want to apply to your origin server. For example, for hosts, you could type req.http.host ~ "www.example.com". Or, for content-type / URL, you could type req.url ~ ".(jpg|png|gif)($|\?)". Click the Save and apply to button. The new condition appears on the Origins page. What if you have a condition already assigned to your origin? Although you can group request conditions on the origin with an 'and' or 'or' clause, there can only ever be one condition rule attached to that origin. 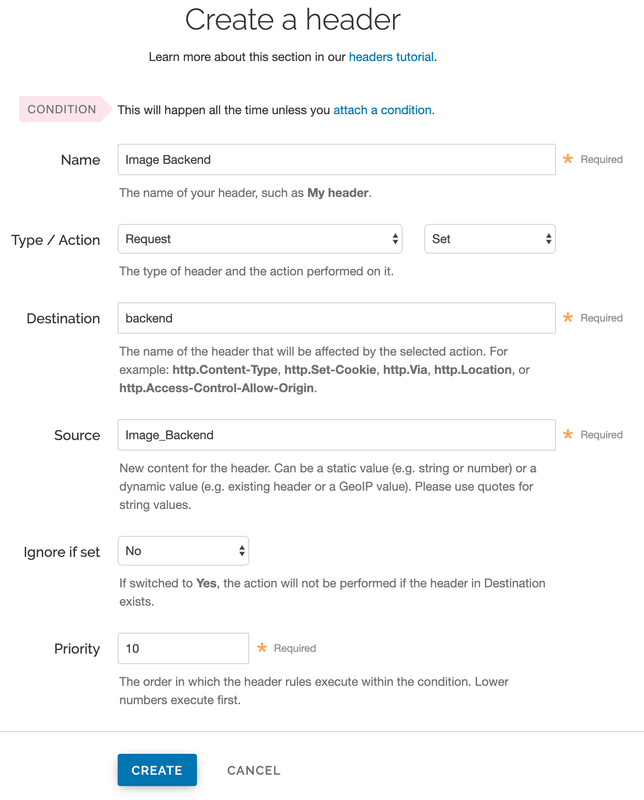 If you want to separate your request conditions instead of grouping them, you can use header rules to route assets to different origins instead. In the Name field, type Image Backend (or any meaningful, preferred name). On the Content page, click the Attach a condition link next to the header you just created. The Create a new request condition window appears. In the Name field, type Redirect Images (or any meaningful, preferred name). 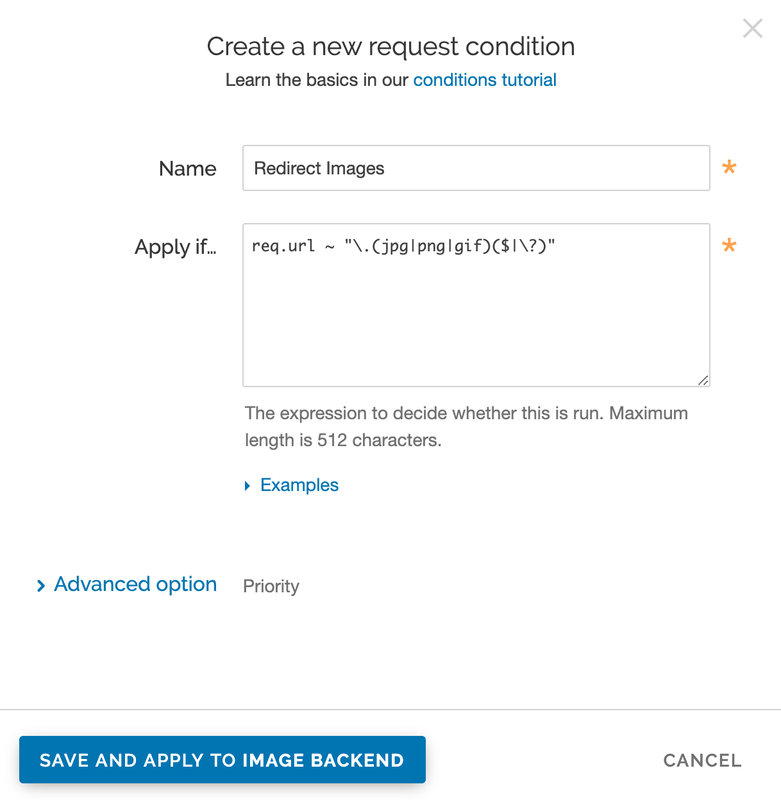 In the Apply if field, type req.url ~ "\.(jpg|png|gif)($|\?)". Click the Save and apply to button. The condition appears on the Content page. TIP: Learn more about conditions in our Conditions subcategory.